TVS Apache RTR 160 4V has been launched in Colombia for the cost of Colombian Peso 6,19,0000 which translates to Rs 1.34 lakh. The bike gets a 159.7cc engine that produces 16.5PS and 14.8Nm of torque similar to the one sold in the Indian market. The engine gets four-valve head and uses an oil-cooling method for heat management. The engine is mated to a five-speed gearbox. The motorcycle carries similar styling as its elder sibling, the Apache RTR200 4V. The Apache RTR 160 4V is a naked street motorcycle which means the body panel on the bike are minimum. The motorcycle boasts a halogen headlamp upfront and gets an all-digital instrument cluster. However, the bike misses out on ABS (Anti-lock braking system). That said, TVS motorcycles yesterday, launched the Apache RTR 160 4V with the Supermoto ABS in India for the price of Rs. 85,510 ex-showroom. Speaking at the launch of the TVS Apache RTR 160 4V R. Dilip, Senior Vice President - International Business, TVS Motor Company, said, "In over 10 years of its existence, the TVS Apache RTR series has created phenomenal customer delight. 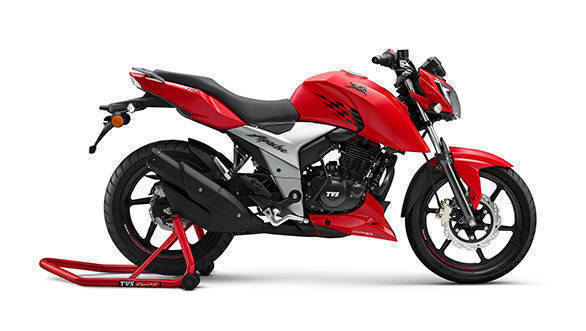 The TVS Apache RTR 160 4V is an exciting addition to the TVS Apache RTR series. It is the most powerful 160cc motorcycle in Colombia and embodies the latest racing technology with best-in-class performance. We are confident that the TVS Apache RTR 160 4V will delight customers in Colombia with its superior performance and dynamic racing look."